Yay for a three day weekend!! Are you going out of town at all? I heard on the news that the most visited city this weekend will be New York. I could only wish I was one of those people visiting it. I haven't been to NYC in over two years I think. I miss the energy, sophistication, and the comraderie of New Yorkers. Perhaps next year I'll find some time to sneak away from work and take the family to visit. My brother and BFF live there so it would be nice to see them! Are you planning on going this weekend or anytime soon? Tonight I have a lovely duochrome holo by Naild' It Unique Nail Polish called Holo, My Name Is... I love that indies come out with polish colors and finishes that are way ahead of mainstream polishes. All you have to do is dream up a color and finish, and I'm sure any indie could help make it come to life. Holo, My Name Is... is a stunning silvery teal blue shift to purple duochrome that has a fantastic linear holo. I used three coats for full opacity and had no balding or difficulty with application. No topcoat in these pics. The first is in the light tent, the rest are under direct light. Beware, this is picture heavy! Oh Lord Jesus it's a fire! Well, those are my sentiments anyway, when I gaze upon this glorious color! I had a difficult time capturing the duochrome color shift, but it's definitely there. 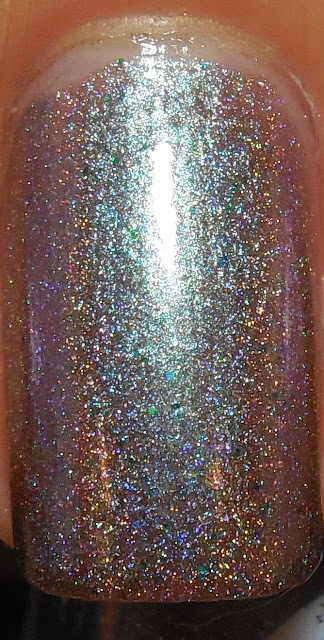 The rainbows in this holo are outstanding and the flare moves as if it had a life of its own. This is definitely one of my favorite indie holos ever and I hope to get more of Naild' It polishes in the future! Have you tried this brand before? PS this post took me two hours to post.... oy vey! LO woke up twice as I was writing this and I had to put her back to sleep each time... I usually have to put her to sleep at least once in the middle of every post I put up, so most posts take me about an hour. My brain is half dead after her waking up twice so I apologize if I didn't make sense above! Beautiful mani! For being such a light silvery color, it is fantastically rich and nuanced. Love it! yes! I'm so impressed by all the facets of color in this holo. it's amazing! This is so gorgeous! I like that the color is unique and not a typical holo color. It's definitely different and I like that. I recently got my first Naild'it Unique polish and I can't wait to wear it.